Learn about the newly engineered Workflow Manager Client 1.0, which provides the infrastructure for workflows in SharePoint, and how SharePoint workflows are integrated with the new model for SharePoint Add-ins. Important: For instructions on setting up and configuring SharePoint and Microsoft Azure, see Set up and configure SharePoint Workflow Manager. 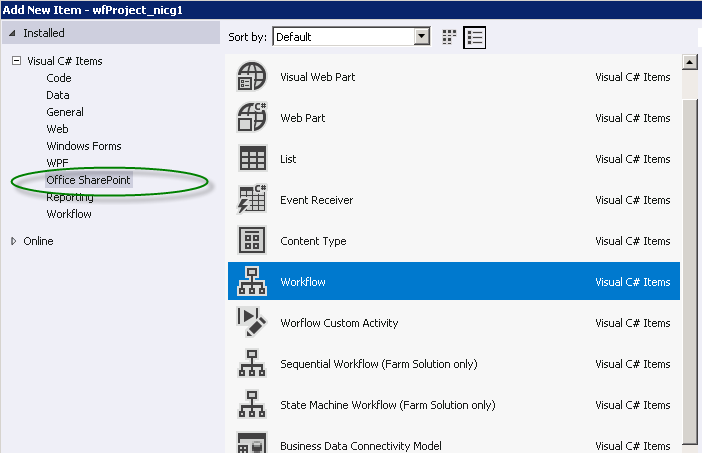 Workflows in SharePoint allow you to model and automate business processes. These business processes can be as simple as a document approval process with a single approver (shown in Figure 1), as complex as customer-facing product catalog using web service calls and database support, or as formidable as virtually any structured business process, full of conditions, loops, user inputs, tasks, and custom actions. SharePoint marks the introduction of Workflow Manager Client 1.0 as the powerful new foundation for Visual Studio workflows. Build on Windows Workflow Foundation 4, Workflow Manager Client 1.0 provides advantages over previous versions that reflect the commitment of SharePoint to the model for SharePoint Add-ins and cloud-based computing. For details of these changes, see What's new in workflows for SharePoint and SharePoint workflow fundamentals. Perhaps most importantly for workflow authors, the way that your create workflows has been vastly improved and simplified. Not only are workflows now entirely declarative (that is, designer-based, no-code workflows), but the primary workflow authoring environments, both Visual Studio 2012 and SharePoint Designer 2013, have been simplified and streamlined. The key enhancements to workflows in SharePoint include the following. For a more detail overview of what's new in workflows for SharePoint, see What's new in workflows for SharePoint. Enhanced connectivity to enable cloud-based execution of workflows. In fact, there is 100 percent parity in SharePoint between on-premises and Office 365 -based workflows. There is full interoperability in SharePoint with SharePoint 2010 workflows, which is enabled by using the SharePoint workflow interop . Enhanced authoring expressiveness by using Visual Studio events and action, web services, and classic programming structures, all in a declarative, no-code environment. Scalability and robustness that is consistent with requirements for Office 365 and the Cloud App Model. Enhanced connectivity to promote highly functional integrated systems. You can call and control your workflows from any external system. Additionally, your workflow can make web service calls to any stream or data source using common protocols like HTTP, SOAP, the Open Data protocol (OData), and Representational State Transfer (REST). Enhanced authoring capabilities for the non-developer in SharePoint Designer 2013, and the ability to compose workflow logic in Visio. Enhanced, and yet simplified, workflow development in Visual Studio, including support for custom workflow actions, rapid development in a declarative environment, single-step deployment, and support for developing SharePoint Add-ins. Full support for workflow-powered SharePoint Add-ins, where workflows function as the middle tier for business process management. Visual Studio 2012 is optimized for developing workflow-driven SharePoint Add-ins and for exploiting the enormous power and flexibility of the model for SharePoint Add-ins. You can use the SharePoint workflow object model to enable workflow logic underneath a SharePoint app in such a way that end users experience the app surface itself while underneath the app is driven by your workflow logic. Additionally, Visual Studio 2012 is ideal for developing Office Add-ins, which can run workflows from inside a Microsoft Office application. There are two primary authoring environments for Workflow Manager Client 1.0: SharePoint Designer 2013 and Visual Studio. Additionally, non-technical information workers can use Visio to construct workflow logic that you can then import into SharePoint Designer and assemble into a SharePoint workflow project. However, the primary authoring environments are Visual Studio 2012 and SharePoint Designer 2013. To help you decide which of these best suits your needs, see the decision matrix in Comparing SharePoint Designer with Visual Studio. In many respects, SharePoint Designer 2013 is the authoring tool of choice for SharePoint workflows. Although some advanced tasks (like creating custom actions, for example) require the intervention of a developer using Visual Studio, SharePoint Designer 2013 provides the most flexible access to workflow development to the widest range of workflow authors. 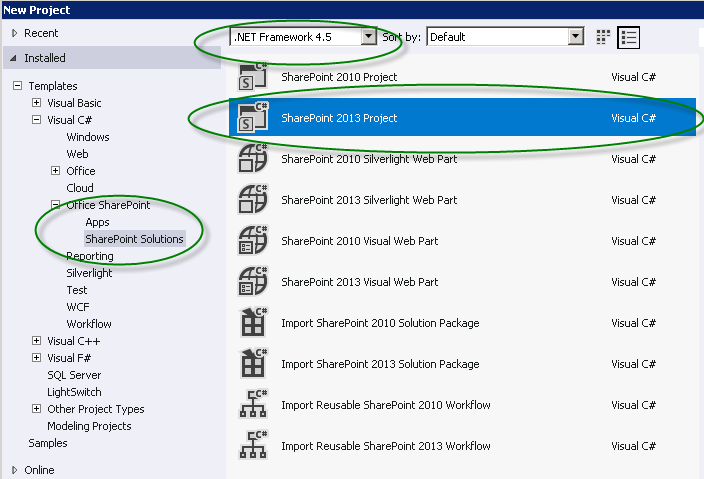 Visual Studio 2012 has SharePoint workflow project types built in. To create a SharePoint workflow project in Visual Studio, follow these steps. Open Visual Studio 2012 and create a new project. In the New Project dialog box, choose Templates, Visual C#, Office SharePoint, SharePoint Solutions, and SharePoint Project, as shown in Figure 2. With the project created, choose Add New Item on the Project menu, and then choose Workflow under the Office SharePoint item, as shown in Figure 3. After the workflow project is created, you are presented with a designer surface on which to create your workflow. The workflow development environment includes a custom toolbox with a large palette of workflow authoring elements.